Description of "ILLUSION OR THE CONFUSION"
Author has opened the doors through his creations that can take you to your life moments. For many instances you will feel that it is your story, while going through the book. The topics like 'I want to', 'the sun set', and 'the all I need'; perfectly describes the life of every person out there. “… In the world full of terms and conditions. He is a Mechanical Engineer and passionate about literature. He is the author of one more poetry book. 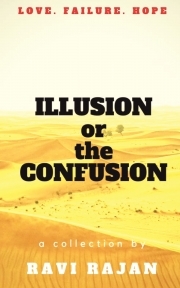 Reviews of "ILLUSION OR THE CONFUSION"